The literal translation of Huevos Ahogados is drowned eggs. In this case, eggs drowned in fresh Tomato-Jalapeno salsa. 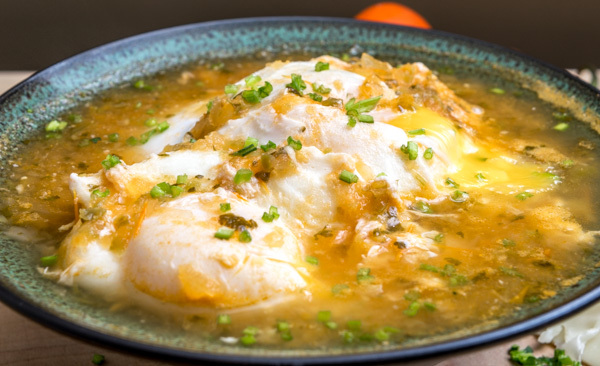 If drowned eggs sounds too somber, you can refer to them as Huevos Abrazados, which translates to eggs embraced or hugged (by salsa!). Either way, give this technique a try and you might find a new favorite dish for breakfast. And lunch. And dinner. A traditional tomato-based salsa tinged with some vibrant cilantro is the perfect candidate to hug your eggs. 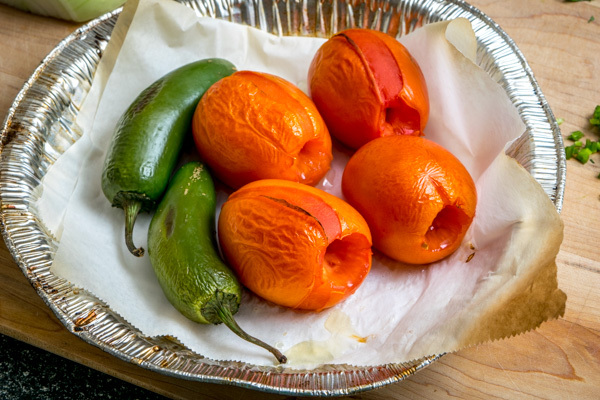 We’ll start by roasting the tomatoes and jalapenos to deepen their flavors. You can blacken them on the stovetop if you want, but lately I just throw them in the oven for simplicity (400F). Note: two jalapenos gives this sauce some kick. If you prefer a milder sauce you can omit one of the jalapenos. 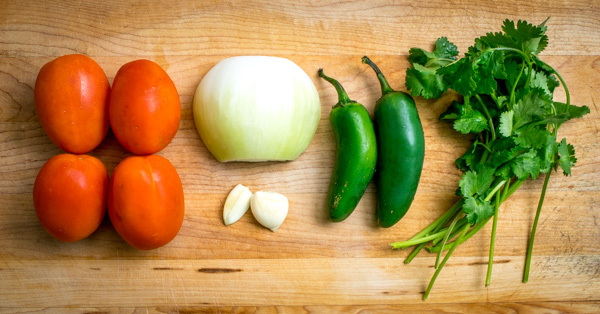 Add the tomatoes, de-stemmed jalapenos, 1/2 onion, 2 cloves garlic, and 10 sprigs cilantro to a blender. Pulse blend until you have thick liquid. Add a dollop of oil to a high-rimmed saucepan on medium heat (I used lard). The pan needs to be deep enough to allow the eggs room to poach in the liquid. Saute the salsa for a few minutes until thickened slightly. Add 2-3 cups of chicken stock along with 1/2 teaspoon salt and bring to a boil. It’s easiest to add the eggs one at a time to the boiling salsa. Cracking them in individual bowls can help with this. 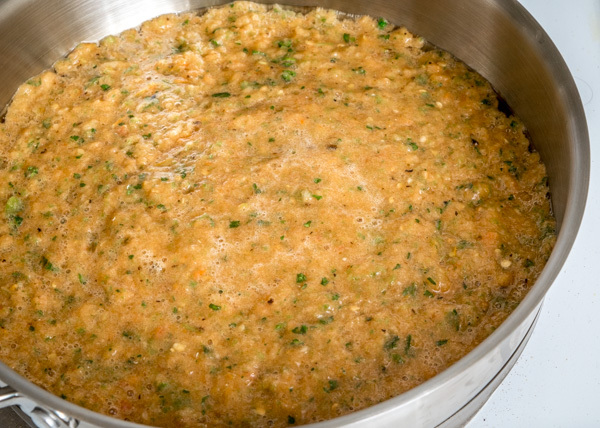 Once the salsa mixture is boiling, reduce heat to maintain a steady simmer. Add the eggs to the salsa. As they start to set, you can spoon some salsa over the top of the eggs to help them set further. It’ll take 5-7 minutes for firm whites and runny yolks, and a couple minutes longer for cooked yolks. 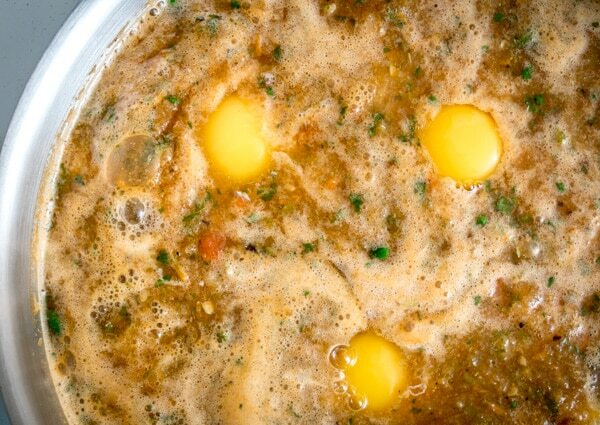 Serve in a dish that lets the eggs sit in plenty of the salsa mixture, because it is delicioso. Season with salt and cilantro (optional). You’ve got lots of options for sides: warm corn tortillas, toast, even bagels….but my go-to option lately is a bean and cheese quesadilla in a flour tortilla. Dipping a crispy quesadilla into the salsa mixture is almost as good as hugging eggs with salsa. P.S. Spend 30 seconds scrolling through our Mexican Cooking Survival Guide and you’ll have 27 new dinner options for tomorrow night. Eggs poached in a traditional Tomato-Jalapeno salsa can do wonders for grumpy mornings! Roast the tomatoes and jalapenos in the oven at 400F for 15-20 minutes. Add the tomatoes, jalapenos (de-stemmed), 1/2 white onion, 2 cloves garlic, and 10-12 sprigs cilantro to a blender. Pulse blend until you have a thick liquid. 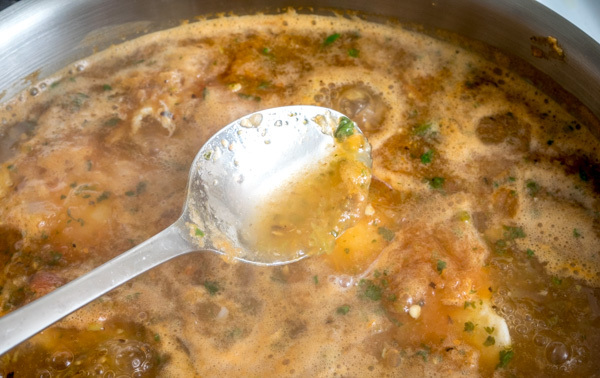 Add a dollop of oil (or lard) to a high-rimmed saucepan. Saute the salsa mixture from the blender until slightly thickened, 4-6 minutes. Add 2-3 cups of stock and 1/2 teaspoon salt. Stir well and bring to a boil. Reduce heat to maintain a steady simmer. Salt to taste. 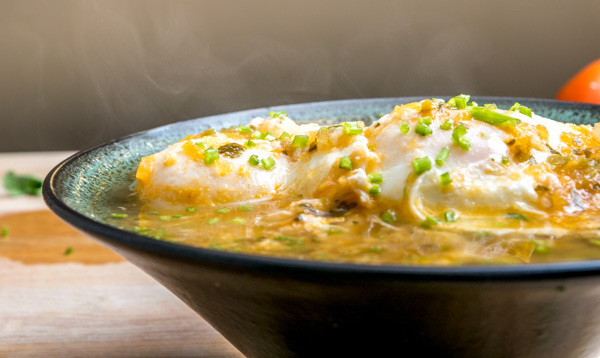 Cracking the eggs in individual bowls makes it easier to slide them into the broth. Add the eggs to salsa mixture. 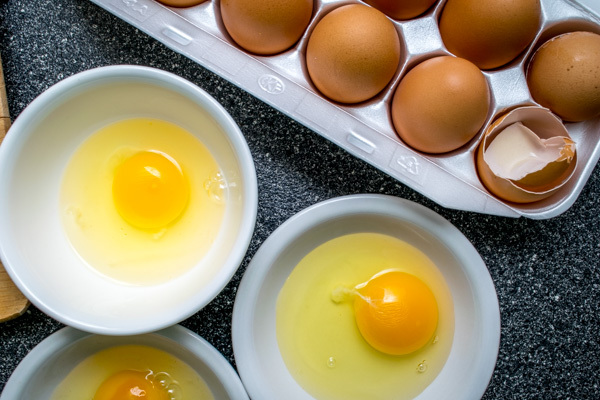 Cook the eggs 4-6 minutes for runny yolks, or a couple minutes longer for firm yolks. 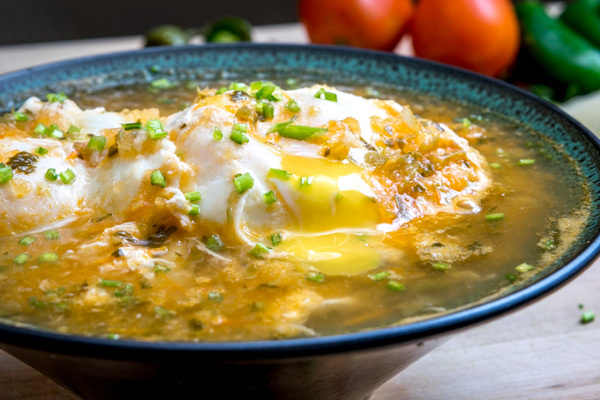 Serve the eggs in bowls along with plenty of the salsa broth. Taste for seasoning and garnish with fresh cilantro (optional). 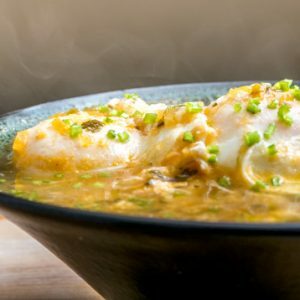 Corn tortillas, toast, bagels, or crispy quesadillas are all good options to dip into the delicious broth. While traditionally made using chicken stock, any stock will do in this recipe. Be sure to serve with lots of the salsa mixture, it's delicious! The exact amount of stock you need to add will depend on the pan you're using. Just ensure the liquid is deep enough for the eggs to poach in. Still hungry? Try making Huevos Divorciados, Huevos Rancheros or Huevos a la Mexicana. 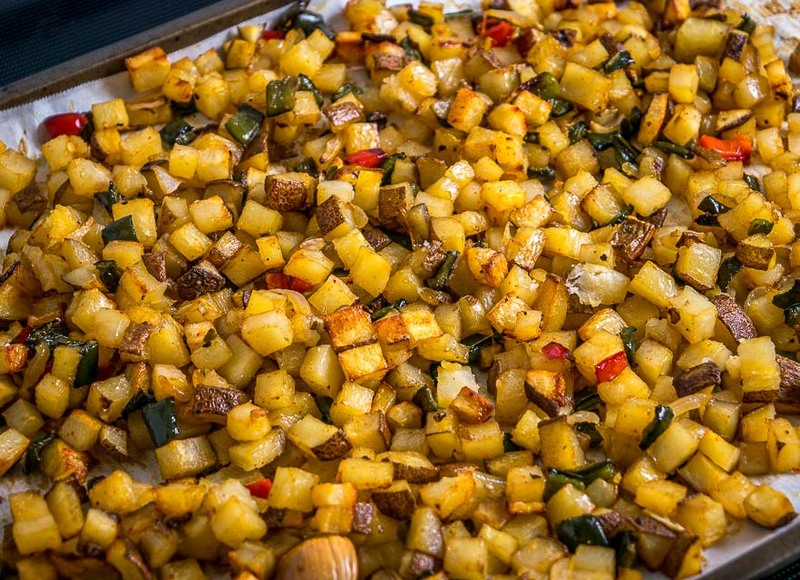 And serve them up with our Skillet Cornbread or our Poblano Breakfast Potatoes.